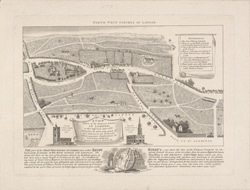 This retrospective bird's eye view of the parish of St Giles, London appeared in Parton's "History of St Gile's''. In the lower margin is a vignette of the Seal of the Ancient Hospital of St Giles, in the background are ruins and a tomb. In 1101, Matilda, wife of Henry I, founded a leper hospital in these fields outside the city walls and named it after St Giles, the patron saint of outcasts.